Over the past five years, global capital markets have experienced unprecedented change. Today, increased regulations, more reliance on technology, reduction in revenue and a greater need to aggressively target new business while still reducing costs have forced all participants to reassess their strategies, operating models and risk frameworks. These challenges are further complicated by fundamental changes among society as a whole. Today’s connected consumers have embraced technology to such an extent that it has become an extension of them. Influence of mobile technology, social media, rising customer experience and service expectations and lower switching costs for customers to take their business elsewhere have dramatically changed the competitive landscape for banks. Both sets of challenges are proving to be Herculean endeavors for banks, and many have realised they cannot do it alone. For years banks have outsourced various business functions to cut costs, but as outsourcing models have evolved, banks have begun to see the value in partnering with outside experts to help them bring more than just cost savings to their businesses. Since the 1970s, banks and other businesses around the world have used outsourcing for functions unrelated to their core business, including clerical, record storage, accounting, data processing, security and plant maintenance. Outsourcers could often do the work at a fraction of the cost of what companies spent to maintain themselves, helping fuel the growth of the outsourcing industry. In 1989, Eastman Kodak’s decision to outsource its IT systems was considered revolutionary. Driven by a realisation that it was in the photography business, not the IT business, Kodak was quickly followed by dosens of major corporations similarly realising that owning technology was not a necessity to their businesses. One such company is British Petroleum. The company began outsourcing selected IT services in 1989, slowly consolidating systems and data centres and decreasing its staff. In 1993, the company outsourced its complete IT operations for its BP Exploration division and has since moved IT functions from other areas of the business. Realising the cost savings and opportunity to gain more flexibility and higher-quality resources, BP moved to completely outsource its global finance and accounting functions in 2012—an industry first. With demand growing, the outsourcing marketplace has evolved, offering more services and greater expertise. Technology Outsourcing has grown beyond server and data centre hosting to include private and public cloud computing, application development and management, software maintenance and enhancement, network management, user support and outsourced database and system administrators. Labour Arbitrage has fuelled new outsourcing models for both operational and technology needs, including off-shoring, near-shoring and right-shoring. While the outsourcing of customer service functions to outside countries may be shifting, use of engineers and programmers in India, Russia, Brazil and China for testing new products, IT services and complex data analysis continues to grow. Business process outsourcing , the outsourcing of back-office functions, has quickly caught on within the financial services industry. Today, top retail banks outsource their mortgage application process to service partners who can process them at a lower cost, using industry-standard process flows and technology. Leading insurance providers have their claims quickly and expertly managed, processed and settled by third-parties. Human resources, procurement, facilities management and payment processing are additional areas organisations have turned over to outsourcing partners. Bank CFOs and CIOs, focused on reducing costs, have begun using managed services for “run the bank” processes, but most still remain married to their outdated, complex and costly systems. Recent challenges and evolving technology are causing the banking industry to rethink the decision to hold onto such legacy systems, processes and business models. Similar to the automobile industry in the 1950s, banks are being forced to embrace change and enable transformation if they want to compete and thrive in today’s marketplace. Increased regulatory oversight—An increasingly complex regulatory environment has forced many banks to revamp their technology and processes—but with looming deadlines, many have opted for faster Band-Aid fixes. Impact on revenues and further compliance requirements, as well as the need for realtime insights from data will drive further change. Technological advancements—The crossover of consumer technologies into the enterprise, multi-customer channel growth and the commoditisation of infrastructure have greatly challenged traditional operating models. 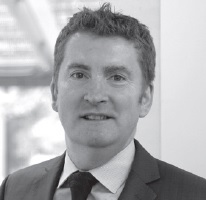 Organisations struggle with a desire to keep everything in-house and the high cost to do so. Higher consumer expectations—With ready access to information, influence of online retail experiences and adoption of new technologies, customer expectations are rapidly changing. This is driving a shift in the market and forcing organizations to develop new interaction models that deliver deeper personalized service and improved customer care. Lower appetites for risk—Recent market volatility and tighter operating margins have caused most C-suite executives to demand cost savings and efficiency gains from every area of the business. Organisations are also realising their legacy systems and manual processes are bringing unnecessary risk to the business. The next step for banks is to embrace outsourcing as a strategic extension of the business for managing core processes and “change the bank” projects. By selecting high-end managed service partners over low-cost options, banks can quickly add deep expertise, best practices, scale and flexibility, best-in-class service levels and technology capabilities to their businesses. The shift is already happening. In fact, according to a 2013 survey by HfS Research, business growth and regulatory compliance are the two most critical business drivers behind financial services firms’ decision to outsource. Managed services have grown to encompass a number of back-office functions, including HR-activities, marketing, risk management, trade reporting, compliance and IT operations. For example, some of the world’s largest financial firms, including Morgan Stanley, First Tennessee Bank and UBS, utilise PHH, the biggest US outsourcer of home loans, to process and originate mortgages on their behalf. Focused solely on mortgages, PHH has the benefit of scale and expertise and can invest in compliance at a level many banks can’t afford. Another example is HSBC. Already using Equifax for risk management services, HSBC turned to Equifax’s proprietary matching tools to comply with Financial Services Compensation Scheme rules. Using Equifax’s SCV system, HSBC can identify and verify individuals more accurately. While driven by a regulatory mandate, tapping into a partner’s sophisticated technology also helped the bank meet strategic goals to improve customer relationships and enhance the customer experience. In an effort to cut their compliance costs, Bank of America Merrill Lynch, Citi, Commerzbank, JPMorgan, Société Générale and Standard Chartered joined forces last year with Swift to develop and use a centralised due-diligence system. This is just one example where banks are letting go of core business processes in favour of third-party managed services. This change among C-suite executives from viewing outsourcing as strictly a cost-cutting measure to being an integral function of their operation is fundamental. Today’s competitive corporation must optimise every process to achieve the best possible business performance. Since all functions, both core and non-core, contribute to overall performance, banks must take a critical eye to all aspects of their business and determine if what they do and how they do it gives them a true strategic advantage. Such decisions are not easy ones to make. But, as technology advances faster and faster, the banking business and customers demand more—exceptional service, faster access to information, personalised products, quicker response rates and transaction speeds, enhanced analytics and real-time decision support systems—and are not willing to wait. Meeting these demands with “five year” implementation plans is no longer feasible. Now more than ever, banks need to be agile. They also need to be more attuned to their customers’ needs—determine how they can better engage with their clients, know the products they want and predict what’s needed rather than wait and react. This means embracing social media, giving customers more ways to interact with the business, rethinking traditional marketing tactics and mastering analytics. Adoption of outsourcing models by the banking industry has been slow—particularly as banks moved from traditional outsourcing to either “run the bank” or “change the bank” initiatives. Firms have an easier time outsourcing initiatives when they fall on either extreme of the spectrum—having a high degree of current investment or having high strategic importance. In the past, it has been challenging knowing when and what to outsource for initiatives where the strategic relevance and investment are somewhere in the middle. Looking ahead, however, few firms have the Digital Transformation acumen in-house, yet it is a strategic priority, making the decision to outsource a logical one. To get there, “Change the Bank” initiatives have started to merge with a broader, multi-industry initiative around Digital Transformation. This new focus has been fueled by disruptive technologies such as Google, iPhone, smartphone apps, and “always on” cloud services, which have transformed customer behaviors and created entirely new products, services and business models. Multi-billion dollar companies like Uber and Airbnb have revolutionised their industries by thinking outside the incumbent analog business model with a new digitally driven one. In this age of digital transformation, agile organisations that can quickly integrate and drive innovation into the business will succeed—those that don’t are destined to the fate of Polaroid, watching profits plummet as digital photography blossomed. For banks, business success will demand enhanced customer experiences, faster delivery of services/products, enhanced process transparency and better analytics. Essentially, these consultants act as new digital change agents and can bring a deep understanding of consumer drivers, new technologies and markets, along with insight into what’s going to happen next. They work with their clients to see what’s coming and help them evolve to meet it. 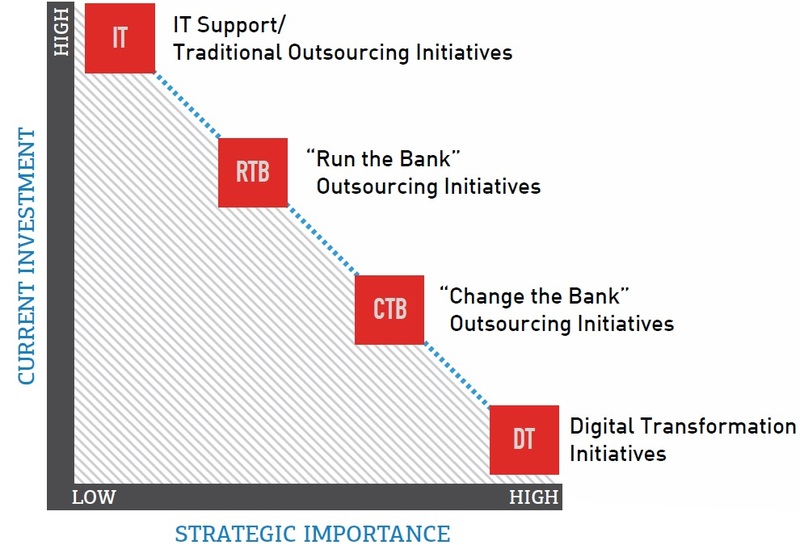 What began as a way to cut IT costs, outsourcing has become an industry standard for many “run the bank” initiatives. Today, faced with an unprecedented number of challenges and changing customer and client expectations due to technology, banks are quickly realising their “change the bank” initiatives are no longer enough to succeed. Digital transformation is the new key to success. To achieve it requires agility, creativity and full digital adoption. Few banks readily have this unique skill-set in-house, leading many to turn to consulting partners who have the experience, skills and creative DNA to enable success in the new digital world. The burgeoning wealth of Asia represents a huge opportunity for asset managers that can scale their businesses across the region, but it will place huge strains on firms’ operations, driving them to explore a new approach to outsourcing. Swedish trading system specialist Tbricks has released OnDemand, a new platform that it says will remove the need for trading firms to make any investment in hardware, installation nor running costs.